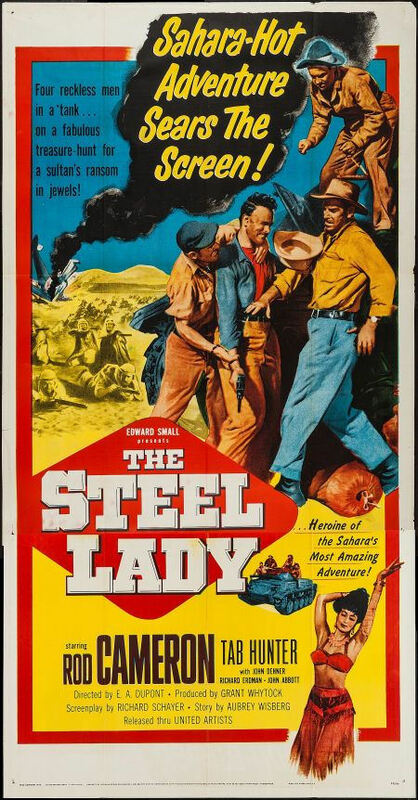 The Steel Lady is one of those films where the plot could be just about anything. You can interpret the title in many different ways, the optimal one being a literal translation that could work like a Supergirl film. This isn’t exactly how it all ends up going down but it is a pretty fun retro film. It’s not great and there is a lot of plot has to be found but I will give it some props for throwing in a good fight. The film starts with the main characters flying around in hopes of finding oil. Unfortunately they are using a really cheap plane in response to budget cuts and as a result they end up crashing in the desert. The nearest town is many miles away and the heroes certainly don’t have enough rations to survive that. Fortunately they find a tank that had been buried and decide to make a gamble. They’ll use the last of their water to fuel the tank and ride the whole way. One of the guys doesn’t like this plan but he is outvoted. Can the heroes make their way to the final in spite of the bandits? The heroes are definitely lucky. That will be your takeaway as you finish the film. They make a multitude of mistakes throughout and have to rely on the kindness of strangers as well as general incompetence from the villains. Before I even get to that I should quickly discuss how the main team is already rather fractured. There are 4 main characters. One of them is a teen mechanic who is pretty good at cobbling things together. He is pretty reasonable except for the fact that he fell asleep at the job and blew their first chance at being rescued. If he had stayed up then the whole film may have been averted right from the start. He ultimately does help make up for it with his radio and by starting up the tank, but that was a pretty big mistake. Then you’ve got the leader of the crew who is the tactician. He is the one who comes up with the plans and alternatives while the others sign off on it. He doesn’t take betrayal well and is ready to fight to defend himself. He is the best character here. Then you’ve got the drunk guy who may as well be an antagonist. He puts everyone at risk for some money and just doesn’t care what befalls the rest of the crew compared to him. Naturally this is all building up to a big redemption arc at the end but you just have to wonder if it is simply too late. It’s just hard to like this guy. At least he did have personality though. The final guy is basically just along for the ride and never actually does anything. There isn’t much scenery to look at of course since the heroes are in the desert the whole time so get used to the sand. It’s hot out there but someone has got to trudge through right? The writing is pretty solid aside from the heroes getting lucky so often. It’s a classic script filled with a lot of verbal shots from all sides. The banter is half the fun here with the other half being the unique plot. Being out of water and supplies isn’t necessarily something new, but it’s not a plot that I’ve seen in action all that much. While the main characters may seem a little ruthless with how they barge into the camp and get ready for a fight, but being prepared is a bare necessity in this neck of the woods. Back to how lucky the heroes are though, the camp that they bust into is naturally owned by bandits. The bandits then invite them in for a party and the heroes can’t refuse. So, the villains’ plan is to search for the jewels while the heroes sleep. After that they’ll send the heroes off to fight a different tribe while they get away scott free. Terrible plan, but why didn’t they just shoot the heroes? It was absolutely an option that they could have gone for at any time. Once the main characters were out of the tank a quick bullet would have finished them. The heroes went straight into the heart of the enemy camp so there is no way they should have left it alive. Throw in the fact that the heroes were naive enough to actually fall asleep and you have a losing combo. Even after that the villains manage to surround the heroes. By this point the tank is nearly out of ammo, but more importantly the heroes are out of water. All the villains have to do is watch from afar and they’ve got the match. The problem is that they forget to keep watch so the heroes run in and murder the sentry while also stealing his water. The villains basically helped the heroes out at this point and should feel ashamed. There is also another occasion where a villain gets in the tank and gets to go 1 v 1 against a guy with a broken leg. He still decides to retreat so I can’t imagine how weak these antagonists must be. Overall, The Steel Lady is a fun film even if the writing doesn’t usually hold up when you think about it. It’s a good movie to look at and wonder how you could have done a better job of it than the heroes. You don’t want to get overconfident of course but it just wouldn’t be that hard with how many mistakes they make. If you want to see an old school survival story about the heroes roughing it in tough terrain then this is the film for you. At the end of the day it’s supposed to be more of an inspirational story and it naturally wouldn’t have had that effect if the villains were clobbering them the whole time. This entry was posted in Live Action Movie Reviews, Live Action Movies, Reviews and tagged Comedy, Film Review, German Tank, Movie Review, Retro, Review, Survival, Survive, The Steel Lady, War by dreager1. Bookmark the permalink.